If you want to leave simple feedback for your students, you can leave a text comment directly from the Gradebook. Locate the student name and assignment where you want to leave a comment. 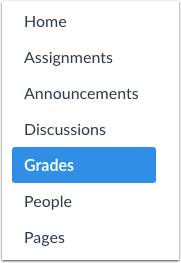 Click the Gradebook cell and click the Grade Detail Tray icon. Type your comment in the Comments field  and click the Submit button . Where there is more than one comment for an assignment, comments will be listed in chronological order with the oldest comments appearing at the top and the newer comments appearing near the bottom . To delete your comment, click the Delete icon . To edit your comment, click the Edit icon  and make your edits in the comment box . When you have finished editing your comment, click the Submit button . The time stamp of the edited comment will indicate the comment has been edited . Previous Topic:How do I override a student's final grade in the New Gradebook? Next Topic:How do I import grades in the New Gradebook? 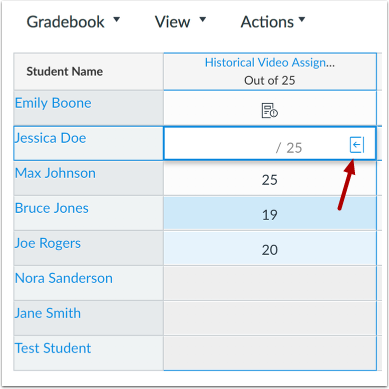 Table of Contents > New Gradebook > How do I leave comments for students in the New Gradebook?